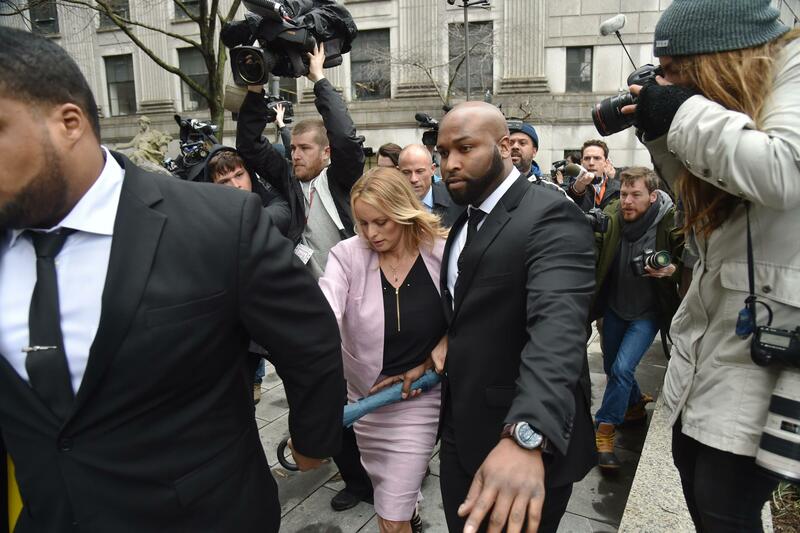 Adult film actress Stephanie Clifford, also known as Stormy Daniels, arrives for the court hearing in New York on Monday. 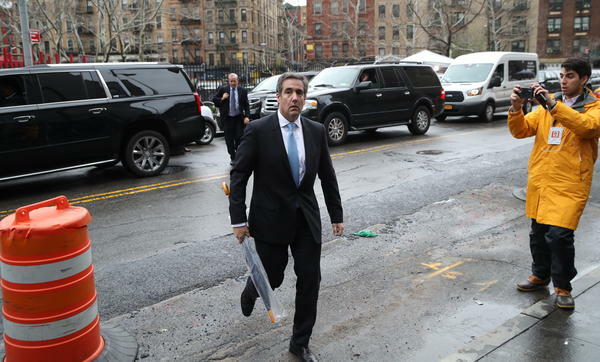 President Trump's longtime lawyer, Michael Cohen, was in court today in New York City. And we learned that Cohen doesn't just represent the president. A federal judge ordered Cohen's attorney to identify another client as part of a battle over the evidence seized from Cohen's home and office. That client is Fox News host Sean Hannity. NPR's Ryan Lucas has been following this story and joins us now with more. Hi, Ryan. LUCAS: Well, the background here is the government, President Trump and Michael Cohen are arguing over the evidence that the FBI seized last week in raids on Cohen's home, his hotel room and office in New York. Now, agents seized a lot of material in that raid. We're talking boxes worth of documents, more than 12 electronic devices, according to Cohen's attorney. Now, Cohen and Trump say that this material is protected by attorney-client privilege. The government says, no, no, it's not. That was basically the subject of this hearing today. Now, Cohen's attorneys had said that Cohen had been working with three clients, but in a court filing in the past 24 hours said that he only wanted to identify two of them. That would be Trump and a Republican fundraiser, Elliott Broidy. The judge said that to know about attorney-client privilege I have to know about all of Cohen's clients, so the attorney told the judge that the third client is Sean Hannity. LUCAS: Hannity talked about it on his radio show this afternoon. He said that Cohen has never represented him in any matter. He's never retained Cohen as a lawyer. He's never received an invoice from Cohen. Hannity said he did occasionally have - he said it as brief discussions with Cohen about things that he wanted legal advice on and that Cohen would oblige. But evidently the relationship was formal enough for Cohen's attorney to identify him in this context in court. Now, Hannity said he spoke to Cohen - the issues that he spoke to Cohen about never involved a third party, tweeted later that it was almost exclusively about real estate. Hannity appeared to be kind of trying to set himself apart from the sort of work that Cohen did on behalf of Trump and Broidy. Those of course involved cases in which Cohen allegedly arranged payments to women following alleged sexual encounters. LUCAS: That was the core question of the hearing here today. Now, attorneys for Trump and Cohen say that they should be able to go through what the FBI seized and determine what is protected by attorney-client privilege and what isn't. The government says not the case. There's a so-called clean team or filter team that would normally do this. It can go through the material, separate the evidence that protected - that is protected by privilege from the evidence that could be used in court, and then it would give that evidence to prosecutors. It's important to point out that while attorney-client privilege is a very important part of the U.S. legal system, it does have exemptions. It doesn't shield attorney-client communications related to future crime or fraud. So even if the FBI did recover some evidence, hypothetically, that suggested Cohen might have discussed future criminal activity with one of his clients, it could still be evidence in a future court case. Now, the hearing just wrapped up. It just finished. The judge is weighing exactly how she still wants to deal with this question of evidence. LUCAS: He's not charged with anything at this point. The U.S. Attorney's Office said on Friday that it has been investigating Cohen for several months. It's a grand jury investigation. It has clandestine warrants that look at his multiple email accounts. They've had those for a while. But prosecutors also have said in court documents that they can't reveal anything about this case at this point in time. It's still ongoing. There hasn't been any sort of indictment that specifies what crimes these could be. All that prosecutors will say is that their investigation isn't about Cohen's legal work. It's about his private business dealings.